Utah is a choice ski destination, dozens of world-class ski resorts all within an hour’s drive of Salt Lake City airport. You can fly and ski in the same day, one reason we love these Best Utah Family Ski Resorts. Big Cottonwood and Little Cottonwood Canyon feature some skiers’ paradise resorts. Park City and Deer Valley make a great ski trip – these ski resorts abut each other with one historic après ski town and plenty of lodging at the base of Deer Valley, Park City and the Canyons at Park City. Deer Valley is very posh, but does not allow snowboarders, Park City is a busy ski resort, emanating from the fun Park City town, with lots of six pack lifts, terrain parks and trails, now encompassing the Canyons for 7,300 acres and Utah’s largest ski resort. Alta and Snowbird are also interconnected for a European like ski experience, with Snowbird’s amazing base to 11,000′ summit aerial tram to the new Summit Lodge at Snowbird. Snowbasin and Powder Mountain are also worth checking out – especially on a powder day. Snowbasin is sister resort to Sun Valley Idaho, with similarly posh on-mountain day lodges, gorgeous long roomed runs and wide-open bowl skiing. However there is no slopeside lodging for your ski family – Snowbasin’s nearest ski lodging is Lakeside Resort or Ogden. Powder Mountain is more rustic, but vast with 8,400 acres including in-bounds cat skiing and guided tours into the side-country. Powder’s new Summit Group ownership plans to create an alpine bohemian village atmosphere amid the 10,000 acre resort with skiing at 9,000′. Snowbasin and Powder complement each other well for a family ski vacation -within a half hour proximity. In other Utah ski news, the proposed Utah Interconnect, ONE Wasatch, will link Deer Valley, Park City, Alta, Snowbird, Solitude, and Brighton. Ski Utah and the One Wasatch proposes connecting 18,000 ski-able acres, with 100 lifts among 7 ski resorts and over 750 ski runs. This Utah ski link is currently being considered by the Utah State government and environmental agencies. 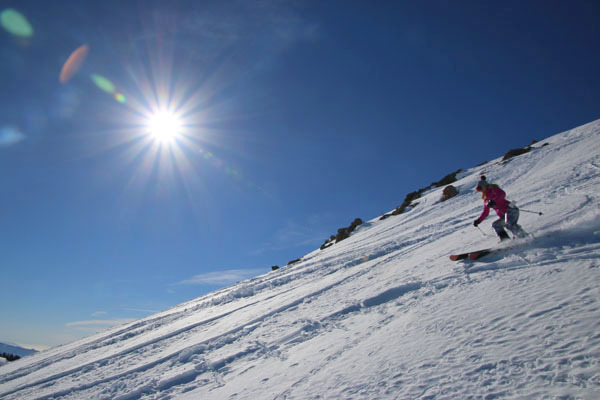 Currently Ski Utah offers a one-day guided backcountry tour to six of Utah’s ski resorts for 25 miles of skiing. Having hosted the 2002 Winter Olympics, and hoping to host the games again in 2026, Utah has everything you want in a ski vacation – big mountains close to a major airport, high elevation, vast ski acreage connected by efficient lifts, with top ski lodging like Ritz Carlton, Montage, St Regis, Waldorf Astoria, and fun après ski resort activities, gorgeous wilderness and mountain scenery covered in abundant dry light snow – which Utah deems “The Greatest Snow on Earth.” Come along for a ride, bring the family skiing, and read our ski reviews of Utah.